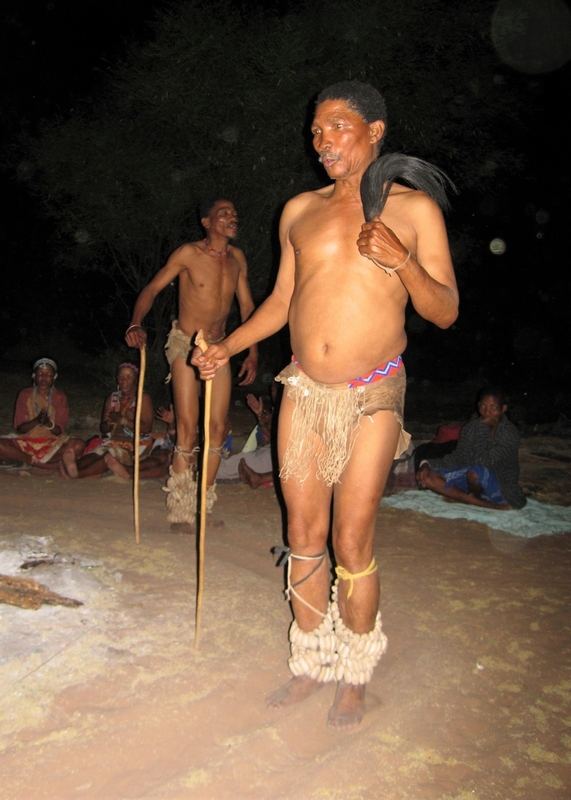 The San (Bushmen) also live as hunters and gatherers. First displaced by Bantu, then by Dutch and German settlers, the largest population today lives in the Kalahari of Botswana and Namibia. Traditionally living as hunters and gatherers, they have adapted perfectly to life in the dry savannah. Only very small groups have been able to maintain their traditional way of life. The traditional dwelling consists of twigs and grass huts. The San are known for their way of hunting, in which they rush the game as extremely persistent long-distance runners until it gives up exhausted. The animals are killed with arrows, which they have coated with poison, which they extract from a caterpillar that lives at the roots of a particular shrub. The picture shows a dancer of the San in Botswana.